The last time we got a peek at the T-Mobile myTouch 4G Slide in the beginning of this month, the pictures were about as sharp as a dull pencil. Today, we have a nice clear look at the device and we have to say that we like what we see. The 4 row landscape sliding QWERTY is well spaced and brings to mind the QWERTY on the HTC TouchPro2, still considered one of the best physical keyboards ever attached to a smartphone. When it comes to a physical QWERTY, HTC thinks of everything; the keyboard on the myTouch 4G Slide includes a dedicated '.com' button that, with the press of the alt key, becomes a dedicated 'www.' button. An 8MP camera is on the back and there are no extra points awarded for guessing where the front-facing camera is. A 1.2GHz processor is under the hood. Besides the hardware, the T-Mobile my Touch4G Slide carries some potent software including Android 2.3.4 which means that gTalk is supported on the handset. Sense UI 3.0 is on top of Gingerbread. The T-Mobile myTouch 4G Slide is expected to be launched July 6th and might put some pressure on Verizon to push out the next generation Motorola DROID 3. Sense 3.0 with a 1.2 ghz processor? Expect major lag, and Wow HTC and T-mo just Killed the Mytouch series. Should have gone with Lighter UI or stock. is it not a dual-core cpu like we heard before? i do like the look of the keyboard though even though it probably wouldn't be any easier for me to use than the one on the Droid 3 because i don't roll my thumbs. the myTouch 3G had stock Android. 3g slide had sense ui. 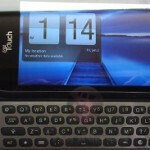 yeah, the Slide was the first myTouch with Sense. the ORIGINAL had stock Android. The HTC Sensation on gingerbread with a 1.2 ghz dual processor lagged because of htc sense 3.0. Imagine how worse is this phone going to be. HTC over did it. Hopefully we are going to have a light version of 3.0 because as stated the new sense is a power hog. Single core processors wont be able to handle it. i believe HTC has stated that some features of 3.0 will come to devices with single-core processors and some won't. could be their idea of a "light" version. i hate that botched up version they have on the myTouch 4G and Slide though, i hope they do away with that. What are you guys talking about. It's been clear from the very beginning that it will have a double core processor. And it's not stated in another way in this news. lol, you said double core... xD well i don't know, that's what i thought too but maybe that's not the case.